To start, like most micro-computerized IH rice cookers the Zojirushi NP-GBC05 is on the expensive side. While its 3 cup size is great for single chefs (or couples) who wish to prepare perfect and consistent rice after each use, for the average-sized family this cooker is not the best choice. For that, along with identical benefits, we recommend the Zojirushi NP-HTC10 or NP-HTC18. should folks prefer something of this caliber. However, should the capacity of this Zojirushi 3 cup rice cooker appeal to folks reading this short review, you’ll be pleased to know that for the money it is one of the best cookers currently on the market. The Zojirushi NP-GBC05 uses 3 technologies to ensure the best rice flavor and texture possible. The thick spherical cooking bowl is designed to maintain even heat cooking while the IH pressure cooking system along with the internal computer monitors and adjusts cooking time and temperature. Folks also have the option to select “GABA” when cooking brown rice. While this will add an additional 2 hour soaking time to the cooking process, GABA-cooking the brown rice releases more nutrients (or gamma-amino butyric acid) in the rice turning it into a healthier and easier to digest meal. Should folks wish to skip the GABA setting, the unit offers a regular brown rice setting along with white, mixed, rinse free, quick cook, sushi, and a porridge setting. The on board menu features an easy to read and operate digital LCD panel, and making selections is simple…just press a button and scroll to the desired setting and press start. Included with the Zojirushi NP-GBC05 is a measuring cup, non-scratch rice paddle, thick non-stick spherical pan, and rice paddle holder. The NP-GBC05 also features a stay-cool carrying handle for easy transport and serving. 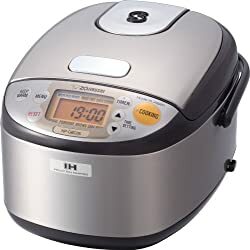 To conclude, we believe that this 3 cup rice cooker is, overall, a great buy, but…so long as folks plan to use it at least twice a week, and cook multiple rice types in order to get their money’s worth from the unit. For preparing that occasional bowl of white rice from time to time, we recommended less expensive units. Perhaps a Sanyo ECJ-HC55S model which also offers steaming and slow cooking benefits. Tip: to extend the internal battery life keep the unit plugged in. Keep in mind that the cooker will still perform properly without the battery since it only runs the clock when the cooker is unplugged. Battery life is approx. 4 yrs.